Discussion in 'Technical Support (AdGuard for Windows)' started by Periphery, Sep 14, 2018. 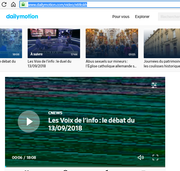 For the last week, I've been facing a problem playing dailymotion videos: the sound is ok but the image is confused. The problem does not come from the filters chosen but from Adguard itself: indeed, even if you uncheck the box "enable ad blocking", the problem persists. On the other hand, by leaving Adguard completely, the problem is gone. To be completely accurate, the image returns to normal randomly a few seconds and then disappears again. The same when SSL filtering is inactive? You could re-enable HTTPS filtering, then start disabling filter lists one-by-one then pressing F5 to force refresh the browser to at least narrow down which filter(s) may be causing the issue. Any Stealth Mode options enabled? If so, try disabling Stealth Mode and try again. Please post two screenshots with and without HTTPS filtering. Second screenshot : the video is not as horrible as the example of the video I proposed in my first post; the image is explicit; nevertheless you can see a shadow image in background (adguard adblocking extension need to be disable).